Mother’s Day is fast approaching and SALT @ The Glass Factory is launching Afternoon Tea just in time for the big day. If you’ve been struggling with ideas for what to buy the most important woman in your life, this could be the answer you’ve been seeking. Since opening its doors late last year, SALT @ The Glass Factory has established a wonderful reputation for its freshly-baked breads, cakes and pastries and now, Afternoon Tea at SALT gives you the perfect opportunity to sample a little bit of everything. The late acclaimed author, Henry James, once said “there are few hours in life more agreeable than the hour dedicated to the ceremony known as Afternoon Tea” and he was right on point. 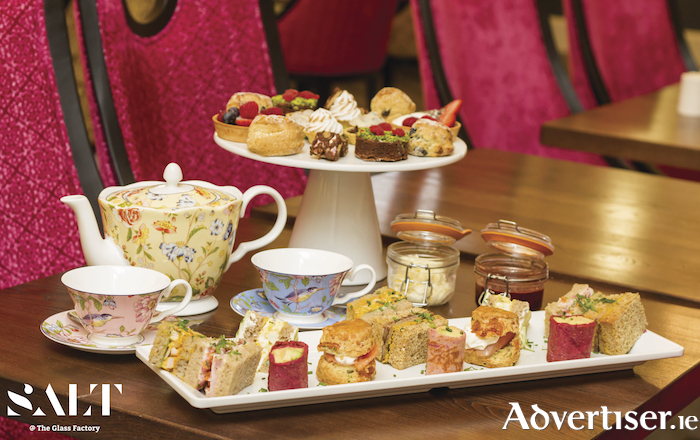 Afternoon Tea has become a hugely popular way to kick back and enjoy delicious food and great company. Now, you can do it all in the opulent surroundings at SALT @ The Glass Factory. A wonderful selection of gourmet sandwiches, freshly-baked mini scones and cakes will be served for Afternoon Tea at SALT, accompanied by tea or coffee. Located upstairs above the Galway Crystal Factory Store on the Old Dublin Road in Galway, SALT @ The Glass Factory is open seven-days-a-week, serving breakfast, hot lunches and tasty treats. Take-away is also available. SALT opens from 8.30am to 5.30pm Monday to Friday and from 10am to 5pm at the weekends. Breakfast is served until 11.45am, with hot lunches from 12noon. SALT @ The Glass Factory can be accessed by stairs or lift and there is wheelchair access throughout the building. Afternoon Tea at SALT @ The Glass Factory costs €28 for two people and begins next week. It will be available Monday to Sunday from 2.30pm to 4.30pm. Booking is essential on 091 757 315.